A local store was having an inventory clearance, so I snagged this dusty gem for $70. 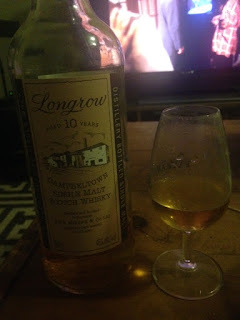 Longrow is part of the Springbank family, so expectations for this one were high. The nose is burning plastic and herbs, in a good way, with a farmy funk. But there isn't much peat upfront, strangely enough. It's quite sweet and bready, with a moderate peat creeping in at the end. It's unusual, not like the current editions of Longrow or Springbank and far more...mild and dilute. But the DNA is there. It's nice stuff, but nothing I'd go nuts for. The finish is too short and it's a tad sugary. Good nose, though. I'll have no trouble finishing the bottle. 85 pts/B. I'd reach for the regular Springbank 10 over this. But I'd reach for Springbank 10 over almost anything else, so is that really a fair comparison? No, but I've already written that sentence and there's no way I'm editing it.